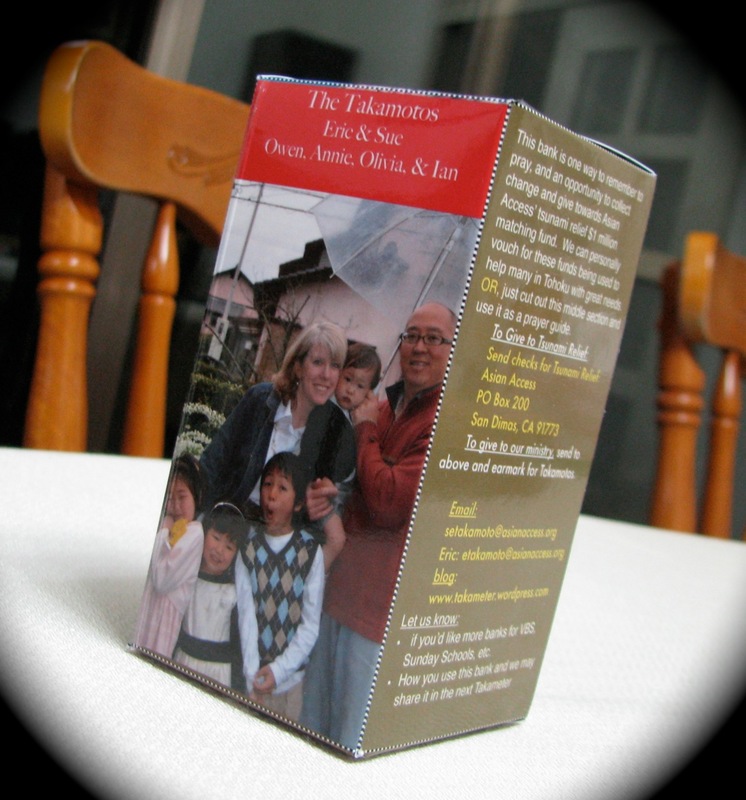 We recently sent out an 8 1/2 x 11 laminated card to our family and friends that can be cut and folded to make a bank — for those who would like to save spare money to give to tsunami relief. One of the very real concerns is that as the media stops coverage of the needs in Tohoku, the still-needed volunteers and giving from the U.S. will dissipate as well. Our friend Gary, who had originally designed the bank, just sent us a photo of our tsunami relief bank put together. Hopefully this will inspire some of you to put yours together! (Note: for the faint of heart you can just cut out the middle section and use it as a bookmark or on your fridge). If you’d like to receive one, please email us your address and we will send one to you. I had a great talk with Eric tonight. Today has been another day in which he has witnessed God’s hands on the ministry in Ishinomaki; we are convinced more than ever that in the midst of great needs, God is doing great things.